Our Mission is to share the Gospel, to spread the “Good News” of Jesus Christ primarily and foremost by living the Gospel: in the work that we do (as a community), the challenges that we share together, and the prayer that we encounter in the presence of the whole Church at prayer, to proclaim that Jesus Christ, the Son of God, died and rose from the dead to save us from our sins. As He came to save us, He also gave his Word to enlighten us and He continues to be at our side, in order to strengthen us, In His Mystical Body, the One, Holy, Catholic and Apostolic Church. This proclamation through prayer we seek to accomplish most dynamically in the Liturgy of the Hours, central to the spritual life and growth of the Civic Friary. In union with the whole Church of faithful Christians on Earth, the saints and heavenly angels, the Civic Friars pray as “instruments of the Church,” since our prayers, when offered with love, are the essential means of the Church accomplishing her Gospel calling, her very mission, to bring souls into a living communion with Jesus Christ. Our service to others, offered in prayer for the glory of God, is a step taken in Faith which has God as our ultimate end. What does this mean? In recent years, many people were attracted to a motto that says eat, pray and love, but the Gospel and monastic traditions are properly ordered to love, pray and feast. For the sake of love, we pray the Liturgy of the Hours and live the Gospel in our work as a community of cooks who prepare and serve delicious feasts. For the sake of love, we also fast. For the sake of love, we nourish our hearts, minds and souls with frequent reception of the sacraments, including Reconciliation and Holy Communion at daily Mass. As we pray the Liturgy of the Hours, we’re not praying alone. We are in communion with the entire Catholic Church, i.e., the entire universal Church. Since Jesus Christ Almighty established the one, holy, catholic (universal) and apostolic Church (Matthew 16), the Apostles, Popes, Church Fathers and holy saints have understood that the Church is the Mystical Body of Christ united in prayer. It is for this reason that ever since Christ founded His Church, Christians have described the Church as praying “through us” and “with us” in unity both with all souls and the heavenly angels, who intercede for us before the throne of God and here on Earth. The Civic Friary’s vocation is to embody the spiritual core values of religious life in a lay setting and to make these beneficial values available and accessible to laypersons seeking them. It is recognizing the truth that living in the presence of God impacts our relations with neighbors in the best way. As a lay community structured on the monastic model, our mission of marrying the work (labora) with prayer (ora) involves being open to the contemplative journey of consciously seeking God, leading us to the state of being and living more deeply and intimately in His presence. 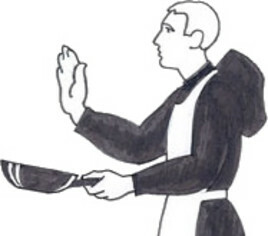 This wisdom and sound spiritual practice is the essence or soul of the Civic Friary, as we adapt the principles of monastic life to our practical experience of living in the world with a new, richer dimension to enhance the lives for everyone interested both in praying and in the culinary arts.